Such a perfect location for a fantastic holiday! 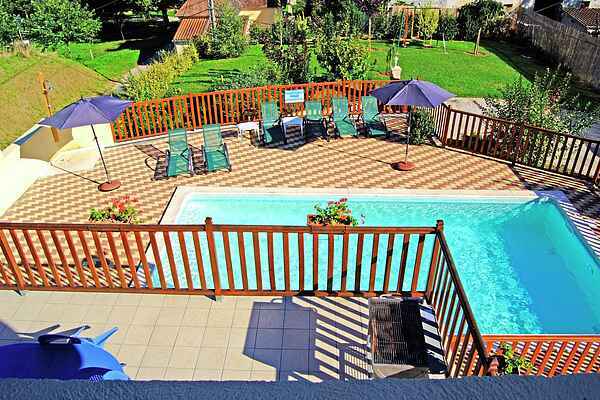 This highly enjoyable semi-detached holiday home (attached to the owner's house) is located 80 meters from the Dordogne river, in Saint-Julien-de-Lampon. A little further away you can rent a canoe to enjoy an unforgettable trip on this famous river. From your terrace you will have a wonderful view of the surrounding hills, and your private swimming pool will be very tempting as well. In the garden full of flowers you will find a swing, ping-pong table and jeu-de-boules game. The location is perfect for exploring the many attractions in the area. The enormous abbey in Souillac (12 km) and the ancient church of Saint-Martin and its beautiful belltower will make your visit to this town an unforgettable experience. Another top attraction is the well-preserved medieval town of Sarlat-le-Caneda (17 km), where you will find beautiful historic houses, a cathedral, a theater from the Renaissance period and the car museum. Along the Dordogne there are many beautiful castles, such as Milandes (32 km), Beynac (26 km) and Castelnaud-la-Chapelle (28 km). The famous Rocamadour (40 km), with its monkey rock, several churches and its phenomenal location are also definitely worth a visit.